Succeed. Thrive. Invest in Your Professional Education. 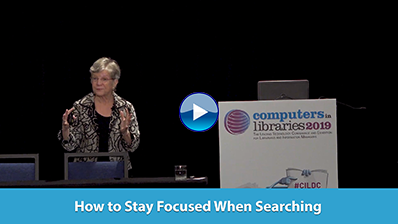 WebSearch University's intensive two days of very focused courses will take your research skills to the next level. A third day of preconference workshops allow for a more in-depth investigation of business resources and alternative search engines. EARLY BIRD DEADLINE IS SEPTEMBER 3! Register Now to Recharge Your Search Batteries & Save $100! Social. Social. Social. It seems that no matter where you turn these days someone is trying to make social media tools work for them. Enterprises are no different. As employees get more and more familiar with these tools in their personal lives, they expect to put them to use for business purposes And many companies are jumping at the chance to fill the void and provide tools for these companies. One such company is Inmagic (www.inmagic.com). With the recent 3.5 release of Presto—its application that enables nontechnical business users to create and manage what it calls KnowledgeNets—the company hopes to bring more functionality to the place where content meets people in enterprises. ebrary (www.ebrary.com) has partnered with the review source CHOICE (www.ala.org/acrl/choice) to offer digital editions of more than 1,000 of CHOICE's recent Outstanding Academic Titles (OAT). Published annually, the CHOICE OAT list represents the top 10% of more than 7,000 academic books, electronic media, and internet resources reviewed by CHOICE that year. Hoover's, Inc. (www.hoovers.com) unveiled significant new enhancements to its business information platform, including the addition of 3 million new email addresses through Hoover's ConnectMail and about 1,800 Morningstar Equity Research Reports (www.morningstar.com). Continuing an ongoing evolution that began with the launch of the new Hoover's platform in March 2010, these enhancements and added functionality give sales and marketing professionals expanded industry insight and more ways to connect with key decision makers and influencers. EBSCO Publishing (www.ebscohost.com) added text-to-speech (read aloud) support to EBSCOhost databases, including its major school and public library databases, by embedding Texthelp Systems' SpeechStream toolbar, a valuable benefit provided at no additional cost to the user. Users will be able to take advantage of this new feature with any full-text articles available in HTML. I'd been hearing some buzz this summer about various improvements made by OverDrive to its services for libraries—more content, mobile apps, simplified procedures, etc. OverDrive is a full-service digital distributor of ebooks, audiobooks, music, and video that first launched its online digital warehouse in 2000. So, I caught up with the company's vice president of marketing, David Burleigh, for an extended conversation on what's new and what's coming. While OverDrive offers publishers a secure, web-based, wholesale distribution service for the sale and delivery of digital media, I didn't get into the details of that side of the business. Our discussion focused on what OverDrive offers libraries and their patrons.